So when everyone has an opinion and most of the books on the market deal with specific aspects on adoption or particular types of adoptions, where do you turn to for reliable information? Start with Adoption For Dummies. Answering the basic adoption questions – How much does it cost? Who’s involved? How long does it take? What do I need to know that I don’t know to ask? And more. Getting started – and figuring out what steps you have to take. Dealing with birthmothers and birthfathers – and why, even though they may not be part of your life, they’re still important to you. Confronting the issues adoptive families face – issues from sharing the adoption story with your child, to answering your child's questions about his birthparents, to handling rude family members who treat your child differently than her cousins. Finding help – from books, resources, and support groups. No adoption book – at least no adoption book that you can carry around without a hydraulic lift – can tell you everything there is to know about adoption. 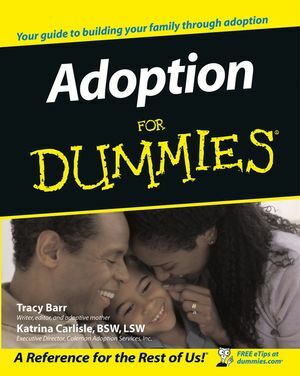 What Adoption For Dummies tells you is what you need to know, all in an easy-to-use reference. Tracy Barr is the coauthor of Latin For Dummies and contributor to World War II For Dummies and Religion For Dummies. Katrina Carlisle, BSW, LSW, is a social worker with 14 years experience in adoption and child welfare agencies. Part I: Everything You Ever Wanted to Know about Adoption but Didn’t Know Whom to Ask. Chapter 2: Sorting It All Out: Types of Adoptions. Chapter 3: The Adoption Process from Beginning to End. Chapter 4: The Gasp Factor: What You Can Expect to Pay. Chapter 5: Who Can Adopt? Chapter 6: Building a Family through Adoption: Is It for You? Part II: Getting Started and Moving Forward, One Milestone at a Time. Chapter 7: Getting the Ball Rolling: Finding an Agency or Lawyer. Chapter 8: Thinking about Your Future Child. Chapter 9: Applications, Home Studies, and Other Really Fun Stuff. Chapter 10: Doing Hard Time: The Wait. Chapter 11: A Child’s Available! Now What? Placement and Follow-up Visits. Chapter 12: Here Comes the Judge: The Court Appearance. Part III: Birthmothers and Birthfathers. Chapter 13: God Bless the Birthmothers. Chapter 14: Birthfathers and Their Role in Your Adoption. Chapter 15: Keeping in Touch: Meetings and Contact with the Birthmother. Part IV: Issues Adoptive Families Face. Chapter 16: All in the Family: Issues You Deal with at Home. Chapter 17: Beyond the Family: Dealing with Outsiders. Chapter 18: What Can Go Wrong and What You Can Do. Chapter 19: In Search of . . . Birthparents. Chapter 20: Ten Great Books to Read to Your Kids. Chapter 21: Ten Support Groups for Adoptive Families. Chapter 22: Ten Helpful Web Sites.